Oh yes, it's that time again! After an extended lull in leaks from the production of Star Wars: Episode VIII, we just got hit with another huge reveal. Today, the Daily Mail has released a ton of new aerial photos of several outdoor Episode VIII sets at Pinewood Studios in London. 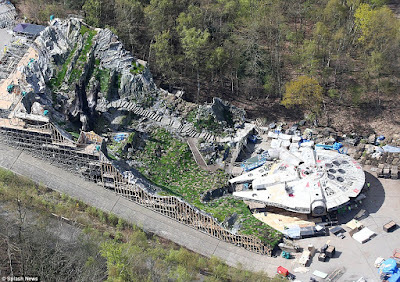 The photos give us our latest look at the Millennium Falcon and a new location on Ahch-To, as well as other buildings under construction. Of course, the following photos could be considered spoilers, so if you don't want to see or know anything about Episode VIII, I suggest you stop reading now. 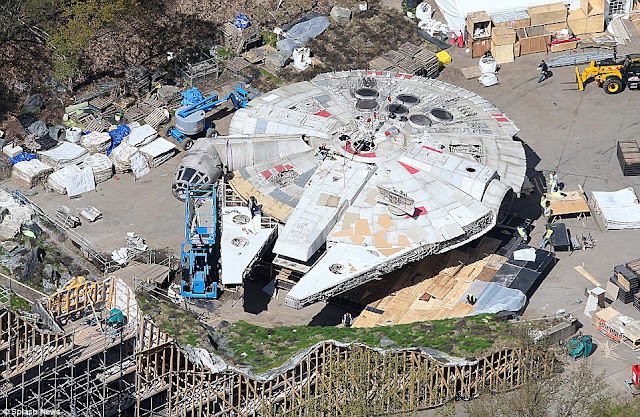 This is your official SPOILER ALERT. 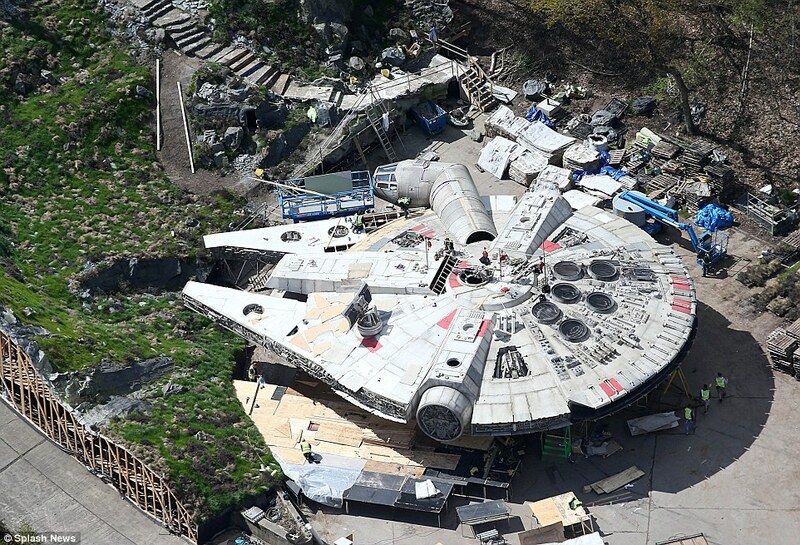 First, we get several different angles of the Millennium Falcon which is being assembled at the bottom of a hill. 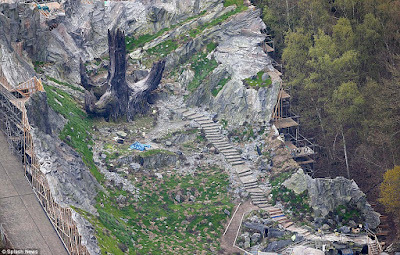 Above it sits a massive set that is unmistakably meant to match the planet Ahch-To, where Rey finds Luke Skywalker at the end of Star Wars: The Force Awakens. While the set features the now iconic rocky stairway, it's what's near the top of the hill that's most intriguing. 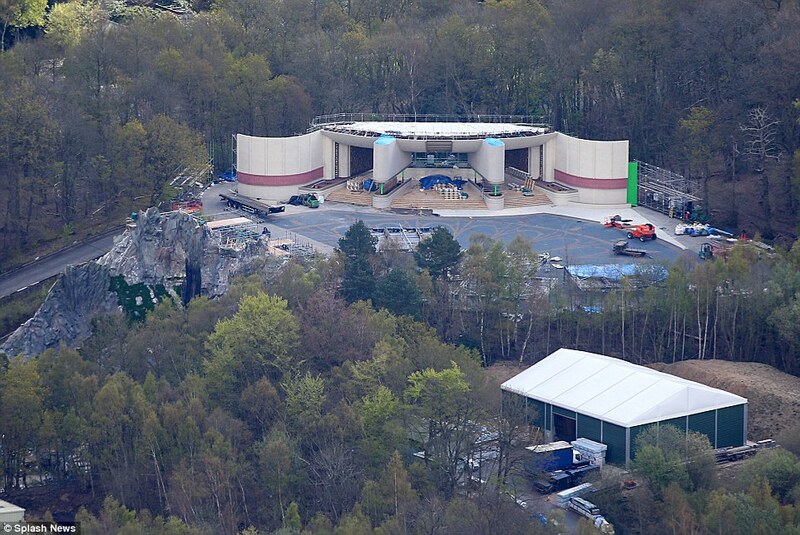 We can assume this is a brand new location on the planet. 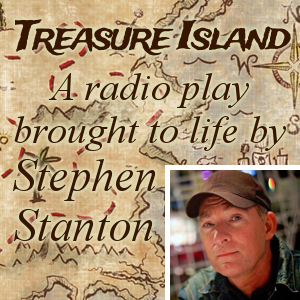 You can check out some of the photos below. In addition, we also get a peak at two other sets. 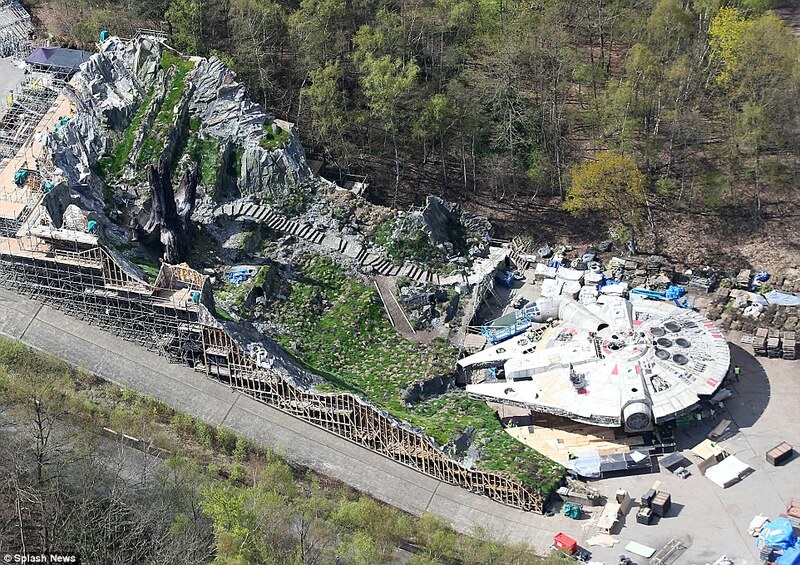 The first being a structure that it located behind the Ahch-To set on top the the hill. This building gives me a Prequel-vibe. It looks like something you might see on a metropolitan world like Coruscant. While I don't expect we'll be going back to that city planet, I'd bet it has something to do with the Republic. The design on the ground in front of it is also worthy of note. 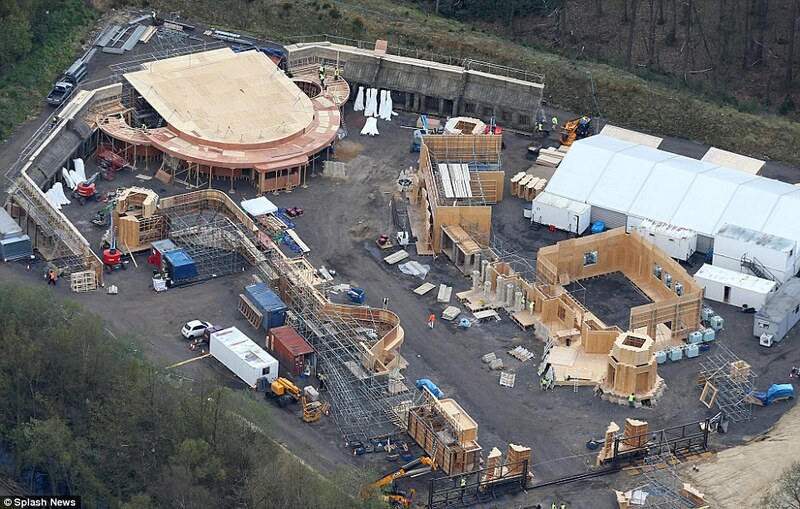 And finally, we have one photo of a set in a different area. 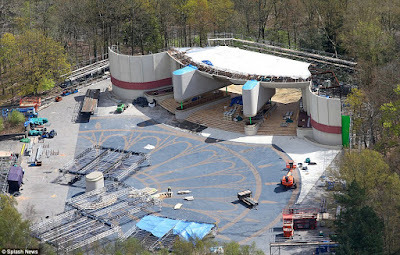 This one is not fully built and features several buildings. Some of the structures have a circular design to them, which could be a sign they could be on the same planet as the building above. Be sure to head over to the Daily Mail to see even more photos of the set, as well as a short overhead video. Star Wars: Episode VIII opens in theaters on December 15th, 2017. Nice! So that confirms that they truly are starting VIII where VII concludes, or close to it. These sets are stunning, they are doing it right! I'd love to see Coruscant at some point during this next two movies, along with Alderaan in Rogue One. But yeah, trees = not Coruscant. Yeah, Mike. It reminded me of Naboo as well. 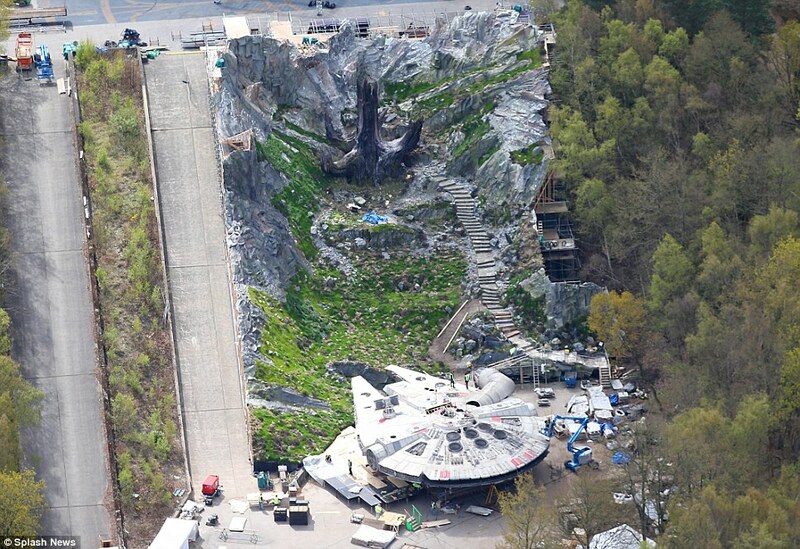 If this was Episode II, all of this, Falcon included, would be CGI. Most of the prequels were done using miniatures, not CGI. Go look it up! There were many Naboo sets and models. I want to know what that crazy tree thing is!! Jedi artifact? 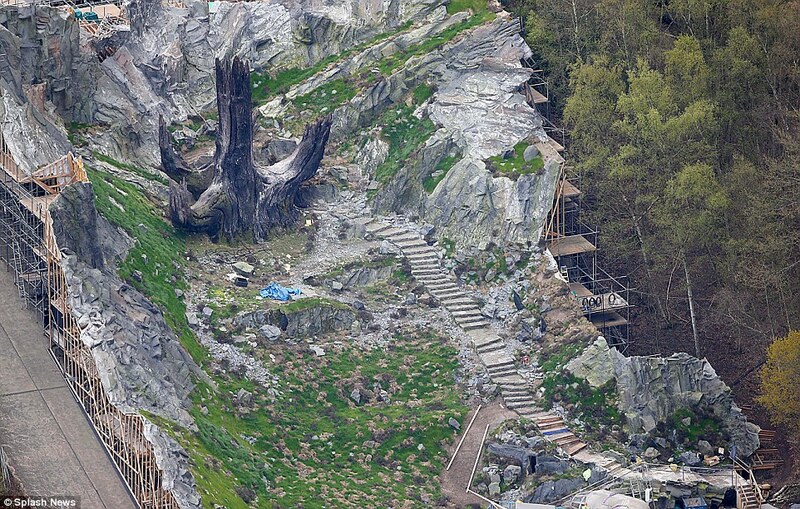 I would say force sensitive tree...perhaps found near the ruins of the first Jedi temple that Luke found?!?!? The others look like Naboo. Yes we do Tony. There part of the story. They make a few mistakes or maybe several but you cant ignore then. And there are still good things in those movies. Read the Shattered Empire comic. The tree is explained in that. The tree was actually from the jedi temple on coruscant. Luke rescued them from a top secret facility the emperor used to store force sensitive artifacts.